Brightvale: a beautiful city, nestled in a valley near Meridell. It is a land of enchantment and knowledge, where the people are encouraged to be as educated as the King's finest scholars. The expansive palace library is always open to King Hagan's subjects and visitors alike, a place I will be sure to visit. But there was no time for that at the present. I had work to do. "Now then, Reginald," I began, as we strolled together through the winding streets of Brightvale. Holmes roosted upon my shoulder, pricking his ears as our conversation opened. "Tell me more about your home. Are there any servants?" "No, none. Just me, my brother, and my sister," the knight answered. "Only my brother. My sister is an Acara." "Ah. So your sister keeps house, then?" "Yes, for the most part." "Well, Elgin and I help when we are on leave from our knightly duties." "Ah, yes, naturally. How many rooms?" "Well, it is a modest home," Reginald said. He continued, counting the rooms as he went, "There are the three bedrooms, the necessary room, the kitchen, and the sitting room. Six in all." I nodded. "And the crime scene, Elgin's bedroom, has it been touched?" "I--I do not think so. My sister might have put it to rights, or she might have been too afraid to. Or perhaps she realized it would be best not disturb the scene. I should have told her so, but to be honest, I had not thought of it." "Then we can only hope your sister was wise enough not to disarrange--or rather, arrange--the furniture." I considered a moment. "That is all for now. Let us hurry on to your abode, and admire the picturesque scenery as we walk." "Walk" is, of course, a figure of speech; one cannot truly walk without legs. But I deviate from the subject. We fell into silence as we walked and admired. Holmes, in our quiescence, dozed off. Ere long, the Brightvale business district was behind us, and we were making our way through the residential areas. Reginald's home was on the road known as the Knowledge Highway, on the outskirts of the land, the Brightvale countryside. Exactly as Sir Evarsum had said, a forest ended just behind the Neohome. "Well, here we are," Reginald announced at last. "Welcome to my humble abode, Miss Thunder. It's not much, but it's home." "A home is a home, be it a castle or hut," I agreed. Fleetingly, I added, "By the way, to whom does the house belong?" "To me and my siblings. We each possess a third of its ownership." We approached the stone Neohome with its straw roof, and my Nimmo companion unlocked the door before leading me inside. He opened his mouth to call for his sister, jumping as she appeared round the door. "Hello, Reggie! I saw you coming up the path. Is this her?" the Acara asked, looking me up and down. I returned the favor. Her colour was Purple, and she was dressed in an elegant Brightvale gown, green at the sides with a white band up and down the front. The eight-pronged gold star, insignia of the World, was emblazoned at the gown's center. "Yes, I am Spottedleaf Thunder, the private detective," I replied, asserting myself as a competent being capable of speaking. "You are Angeline? Pleased to meet you." "Oh--yes, I am. Good to meet you," was Angeline's response. "Well then, I will not waste time," said I. "If I may have a look at the room of the missing person, I would then like to have a few words with you, Miss Evarsum. After that I will continue the investigation elsewhere." "Oh! But what about Elgin? Do you think you can find him?" Angeline inquired anxiously. "I can guarantee that I will find your brother, but I cannot guarantee that you will be happy with the results," I replied cryptically. "Now, may I see the scene of the crime?" The front door led straight into the living room. Two doors and a staircase branched off from there. Ignoring the doors that led to the kitchen and bathroom, Reginald and Angeline led me upstairs, where a narrow hallway linked three bedrooms. "The one on the right is mine," the lady of the household elucidated, "the one in the middle is Reginald's, and the last is Elgin's." "Have you touched the room since the crime?" "No, miss. In fact, I've locked it." "Very wise of you," I felicitated. The door was unbolted and opened. Angeline took a step forward and faltered. "Perhaps you two ought to wait here," I suggested tactfully. "I prefer to be alone when I comb a room." The Acara blinked gratefully and I slid into the room. It was exactly as Reginald had described it, in complete dishevelment. Evidently, Elgin had put up quite a fight. During the battle that had taken place, a desk and its chair had been overturned, and a bookshelf had been knocked over. The only decoration, a fragile vase, had been smashed. Various items littered the room. An inkwell had poured its contents on the wooden floor. Looks like I have my work cut out for me, I thought. I poked the sleeping Holmes with a feather. He opened one eye and cocked his head. "Time to start looking for clues," I told him. He squawked and flapped off my shoulder. On silent wings he circled the room, wary eyes roving the area. The hunter searching for prey. I flattened myself on my belly to do the same. Magnifying glass in wing, I scoured every inch of the bedroom, leaving nothing unturned. Under the bed, under every book, under every paper I searched. In the ink puddle I found a small, flat metal disc, turned ebon by the ink. Under the bed, among a number of books and scrolls and an amplitudinous population of dust Cybunnies, I found a wrinkled, frayed parchment. But it was Holmes who discovered the final clue. It was as I was putting the bookshelf to rights to probe beneath it that Holmes screeched and dove out the window. I dropped the shelf, nearly crushing my tail, and rushed to the fenestella. At first, I thought Holmes had attacked some poor Miamouse; I was proven wrong when the Whoot rose to the window a moment later, a small piece of green fabric clutched in his talons. Looking down, I saw a neat row of Spiky Bushes cultivated along the wall of the house. Beyond this, a garden growing various eatables covered the ground between the dwelling and the forest. But it was the bushes that interested me more. "Did this get caught on the bushes, Holmes?" I asked, taking the bit of fabric. Holmes hooted and nodded eagerly, alighting on the windowsill. At just that moment, Reginald reappeared in the doorway, Angeline beside him. "Is anything the matter? We heard a cry and a crash." "Simply a method of sleuthing discovery," I laughed. "My partner here found this." I held up the green fabric for them to see. "Could be anything," said Reginald. He came forth to feel it. "I recognize this material. I'm almost certain this is from a Brightvale knight's tunic." "I do not believe so. I could fetch it for you to check, if you would like." The garment was retrieved from the knight's room, and looked over thoroughly; but there were no fragments missing, and few tears. "So that is that," I declared. "You keep your uniform very tidy, Sir Reginald. I will have to search elsewhere for the owner of this shred." "If you ask me," Reginald stated, "that fabric belongs to Telvar." "It is a possibility, but whether or not it is the truth, I will soon ascertain. But first, I--"
"How do you suppose they got up?" Angeline asked suddenly. "The kidnapper, I mean, to the window." "A good question," I replied. "Exactly the one I wanted to ask next. How did the kidnapper make it this room? A rope, perhaps, or a ladder? A rope could be lassoed to the eaves, perhaps, but it would be almost impossible to return to the ground with an abductee. No, a rope is very unlikely. As for the ladder, it would most likely leave an indication on the ground below. Excuse me." Without further ado I lunged out the window, and in a few shakes of a Hissi's wings I was safely hovering above the ground, searching carefully for anything in the dirt that might suggest a ladder. But there were no recent marks. I examined the Spiky Bushes, but they were in perfect order. No broken branches or leaves, nothing to prove a ladder had been shoved amidst them. Finally, the wall; again, no marks. That done, I returned to Elgin's room. As soon as I had landed upon the wooden floor again, Holmes landed upon me as usual. I announced, "I do not think the abductor used a ladder, or a rope, which would mean either that they flew to the window, or, in the less likely case, that they came in by the front door." Angeline shuddered. "I do not like to think they came in by the door--I do not like to think they came in at all! But--oh, wait!" she exclaimed suddenly. "They could not have come in by the door, for it was locked as usual the next morning, I am certain of it." "And besides, the fabric," Reginald added. "Which means they must have flown. And the fabric says they were a knight. And both point to Sir Vestan! I am telling you, Miss Thunder, he kidnapped my brother!" I did not expound to him the other clues I had discovered. For the moment, I wanted to keep them to myself. Instead I said, simply and crisply, "I know your theory. But it was you who hired me to uncover the truth, Sir Reginald. And that is exactly what I intend to do. I will thank you to stop jumping to conclusions." "I apologize, Miss Thunder, I got excited again. It's just, this whole ordeal--!" The Nimmo threw his hands into the air. "I understand. Now then, Miss Evarsum, may I have a word with you?" "Certainly, miss," was her reply. "Alone?" I added, casting a glance at Mister Evarsum. "Oh, of course, miss," Reginald agreed. "I'll go prepare lunch, shall I?" He added respectfully, "Ladies," bowed, and departed. "So, Miss Evarsum," I began. "The beginning, if you would. When was the last time you saw your brother, Elgin?" "The night before last. I went to bed early, as usual, while Elgin and Reginald were still up playing Key Quest, as usual. I--I never suspected--" she choked. "No, of course you did not," I commented soothingly. "It was a night like any other, nothing out of the ordinary. Who could possibly have foreseen what was to come?" She nodded, wiping a few tears from her eyes. "That was the last I saw of him." "And is that all you can tell me?" She hesitated. "N-no. You see, shortly after I retired, before I had even fallen asleep, I rose and went downstairs for a glass of water. But neither Reginald and Elgin were there, and when I went upstairs again both their doors were open, their rooms empty." I tilted my head. "Indeed? How interesting." "It was probably nothing, though. They were probably out in the garden. I see them out there during the night, occasionally. Sparring, I think. In the middle of the night, and such a cold one at that! How silly they can be sometimes!" She shook her head in amusement, sniffing and wiping away tears as she reminisced. I hoped dearly that there would be more such happy times in the Evarsums' future. I pulled her gently from this remembrance. "During the night, Miss Angeline, did you hear anything? Moving or falling furniture?" She shook her head sadly. "I was wearing earmuffs. It was a very cold night, and Reginald suggested we all do so, so we would not catch Sneezles. An exaggeration, perhaps, but a good idea. Or so it seemed at the time. But now, I did not hear a thing because of it!" I sighed. "Yes, how unfortunate. Is there anything else you can tell me?" Angeline considered for a moment, and at last shook her head. "I wish I knew more. I wish I could help you. But I cannot." I shrugged. "Perhaps you have helped me more than either of us realize yet. Now, come, let us join your brother." Together we left the room of the missing Neopet and descended the stair. Reginald was in the kitchen, preparing a salad with a number of Brightvale's famous fruits. "Will you stay for lunch?" the Nimmo offered. "I made enough for all of us." "I thank you, but no," I declined. "It is my practice not to eat during a case. I find the mind is sharper when the body is hungry. Now, let me see, what is the time? 5:00. That leaves a period long enough, I think, to interview Mister Evarsum's primary suspect, before the scheduled payment of the ransom. So tell me--where may I find this Vestan Telvar?" Vestan Telvar: a tall, stalwart Brown Eyrie, with an impressive, authoritative manner. I found him training in the Brightvale Castle courtyard, beating the stuffing out of a practice dummy with a ferocity I had never expected to see the likes of in Brightvale. I whistled. Holmes hooted. I will have to choose my words carefully, I observed silently. I would not like to be on the wrong side of those extraordinary thews and claws. Aloud, I called, "Excuse me--Sir Vestan? Are you Sir Vestan?" Vestan paused amidst the act of attacking his synthetic opponent, which was already prone and torn to unrecognizable shreds. He glanced at me, sizing me up, and replied gruffly, "Indeed I am, miss." "I should like to have a word with you, if I may." The knight dusted himself off, removing from his tunic the straw of which the dummy had been made. Leaving its remains in a heap, he strode over to me. His eyes scanned me, resting longest on the Whoot perched upon my shoulder. At last my request was answered. "I suppose so." "I do not think I will take up much of your time. I simply wondered, do you know where I may find Sir Elgin? Do you know him?" Telvar scowled disdainfully. In his deep, harsh voice he responded, "Yes, I know him. Cannot say that I know where he is at this moment. I imagine he'd be in the barracks or the library or--no, he's on leave, I think. Why do you want to know, anyway? Are you a friend of his? If you're looking for him, you're on the wrong side of Brightvale." Nothing in the knight's attitude suggested that he had any idea that Elgin was missing. Either he was a very good actor, or he was innocent. "I already tried his home," I said slowly. "He was not there." "Must be out, then, or in another World perhaps--how should I know?" "If you truly have no idea where he is, it might interest you to know that Sir Elgin has been abducted." The Eyrie's eyebrows went up. "Has he now? Went and got himself kidnapped, did he? A knight, even!" He guffawed, long and loud. "You do not seem too broken up about it," I observed, eyes narrowed. "Cannot say that I am. Never liked the chap. Rather too good for--well, for his own good," Vestan responded with a smirk. "And you haven't any idea who might have abducted him?" "Cannot say that I do. Say, what's the meaning of all these questions, anyway?" His eyes narrowed suddenly. "You're not accusing me of anything, are you?" "Contrariwise, I am confident that you are innocent," I replied diplomatically. "The evidence against you is simply too great. Take, for instance, this." I held up the bit of fabric. "I found this caught on a bush outside the Evarsum Neohome. I can't help but notice that there is a hole in your tunic, recently sewn up." "Now look here, if you think I'm going to waste my precious time giving you an alibi and all that nonsense--"
"Unnecessary," I assured him. "I have but a few more questions to ask. First, do you remember when your tunic was damaged?" "Of course not! I noticed there was a rather large tear in it one day and sewed it up. I have no idea how it happened." "Unfortunate," I muttered. "But tell me this: when was the last time you saw Sir Elgin?" "A sparring match," Telvar answered immediately. "A rather--er--spirited one, it was. Possible that bit of fabric was riven off then. That was nearly a week ago. That very day I was sent off on a mission to break up an outfit of brigands who had been marauding travelers. Ended up taking a few days; they escaped me the first time, and I had to track them all the way to the Haunted Woods before I caught them." He puffed out his chest proudly. "But Sir Vestan always gets his Neopet. I've never failed a mission!" After a few words to satisfy the Eyrie's ego, which was matched only by his muscles and, I suspected, his temper, I said, "Well, that is all I wanted to know. Thank you for your time, Sir Vestan. I will not detain you any longer." The knight bowed ungraciously and returned to his training. "So that is that," I said to myself. "We have ourselves another suspect." My interview with Vestan Telvar over, Holmes and I returned to the Evarsums' Neohome, literally as the Crokabek flies. Upon my arrival, I wasted no time, and got straight down to business. "The time to meet with our abductor is drawing near. 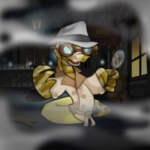 Reginald, do you have the Neopoints?" "What? Of course not!" the knight exclaimed. "I wanted you to catch the kidnapper," he protested, "not pay them! We cannot possibly afford the ransom! But if we do not pay now--"
"Oh!" Angeline gasped. "But we must pay them, somehow!" "Do not worry yourselves," I said soothingly. "I will pitch in to raise the Neopoints. But before my job is finished we will both have our money back and this criminal will be brought to justice." From my coat pockets I withdrew several bags of Neopoints, part of my payment from a recent case. These I transfered to Reginald's hands. "Thank you, Miss Thunder," he breathed. "We will never forget this." "It is nothing, really. I will get my Neopoints back, and you will get... most of yours back." I winked. Reginald laughed. "Of course, Miss Thunder. If you find our brother, we will gladly guerdon you." "In the meantime, however, we have an abductor to meet," I said. "How shall we handle the matter?" "The note said 'come alone,' " Sir Reginald pointed out. "So perhaps I ought to do just that." I nodded thoughtfully. "To be present at the scene would be very beneficial to me. But I suppose that it would be best for--"
"By all means, then," Angeline interrupted, "do you go. Don't you agree, Reginald?" Her brother nodded. "Of course. The letter said to 'come alone,' but it did not specify whom was to come. It would be best for you to go, Miss Thunder." "Very well," I consented, "I will represent your family in this little meeting. I shall leave right now. Hopefully Sir Elgin will accompany me on my return." With that, I set out for the Wheel of Knowledge, Holmes on my shoulder and two million Neopoints in my wings. It was not a time for admiring scenery. The hour the abductor had chosen for the meeting was nigh, and I made my way to the rendezvous at a rapid pace. When I arrived, there was not a soul in sight. Most Brightvalians were probably eating dinner at that hour, or reading, or puzzling over crosswords, or what have you. Even the Draik that operated the Wheel of Knowledge was inside the wheel's house, out of sight. I felt suddenly alone and vulnerable. Holmes squawked and rubbed against my head. I smiled. It is strange how acute a perception of emotion Petpets possess. It is almost as if they can read your thoughts. "I'm sorry, Holmes," I apologized, "of course I'm not alone. I know I'm safe with you." The Whoot inflated his lungs and ruffled his feathers, making himself appear nearly twice his actual size--that's when it happened. Someone collided with me from behind, knocking the Neopoints from my wings, the Whoot from my shoulder, the air from my lungs, and me from an upright position. Feet scuffled around me as my assailant gathered up the bags of money. I raised myself off the dirt just in time to see a figure, clad in black from head to foot, take to their heels. The figure was tall, stalwart, and winged. To all appearances, Vestan Telvar; but appearances are, I knew, occasionally deceiving. "You'll not get away from me that easily!" I exclaimed, taking wing. In more than one sense of the word I flew after the thief at top speed. However, this Neopet had long, powerful legs. Even by air I could not match his speed. The longer I pursued the greater the distance grew; finally, I accepted defeat. Panting, I landed and collapsed to the ground. Moments later I felt feathers against my scales. "Holmes," I muttered, "they got away. It was the abductor, I'm sure of it." The Whoot rubbed against me sympathetically, and I hugged him. As soon as I had caught my breath, we flew together back to our clients' dwelling. "The Neopoints were stolen," I announced cheerfully as I entered. Holmes squawked. Angeline gasped. Reginald leapt to his feet. "But--what of Elgin?" the latter exclaimed. I shrugged. "Alas, that I cannot answer. Not yet. But I will know soon where Elgin is and who took him." Reginald sat down slowly. "Good. My goodness, I hope he is all right." "This whole ordeal," Angeline said, putting her face in her paws. "It is too horrible--too horrible!" As her brother comforted her, I silently took my leave. I had no business amidst their sorrow. My business was to resolve it. "Now then, Holmes, there is naught left to do but solve this case. I have three suspects: Sir Vestan, Sir Reginald, and Miss Angeline. There are reasons for and against all of them. The question we must now ask ourselves is: 'Which of them is the criminal?' "
In case you were wondering, Spottedleaf_789 can be found on my side account, Thunderclan_tomcat. Thank you for reading! I hope you have enjoyed the median part of my story. Any comments, compliments and especially constructive criticisms, are welcome. Please join us next week for the conclusion!